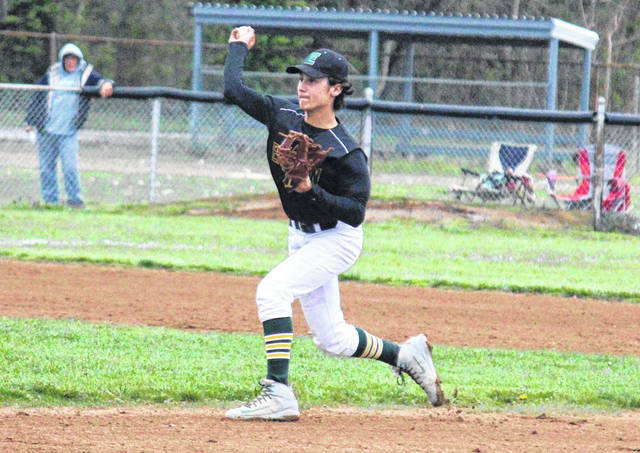 Eastern freshman Matthew Blanchard throws to first base during the Eagles’ 7-0 victory on Wednesday in Mason, W.Va.
MASON, W.Va. — Another pitching gem and another chance to break out the brooms. 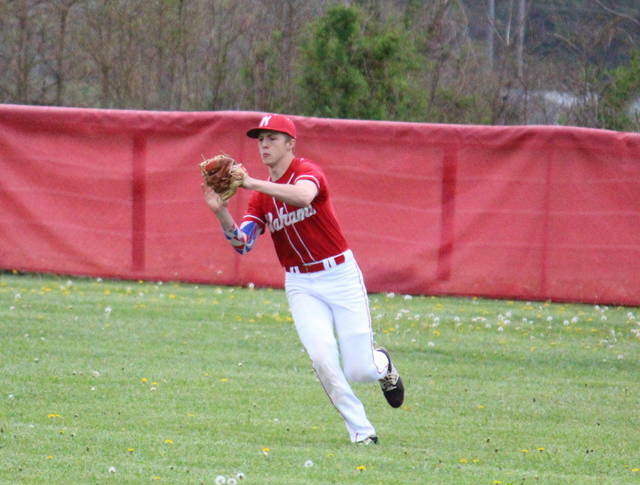 The Eastern baseball team completed the season sweep of Wahama on Wednesday in Mason County, as the Eagles gave up just two hits en route to a 7-0 Tri-Valley Conference Hocking Division win. 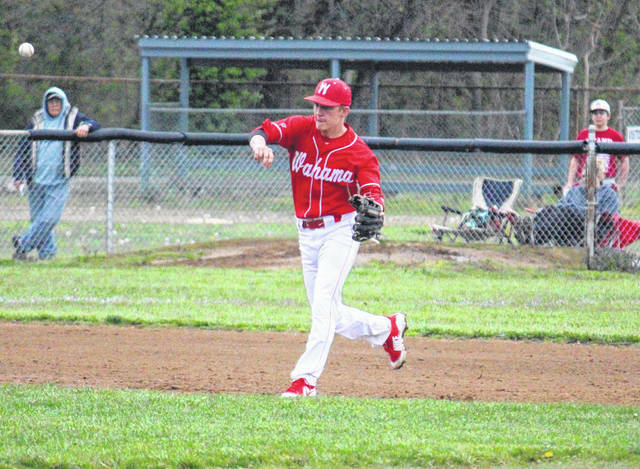 Eastern (15-2, 11-1 TVC Hocking) took a 1-0 lead in the top of the opening inning, as Ryan Harbour drove in Christian Mattox, but the Eagles left the bases loaded in the first and then went down in order in the top of the second. Wahama (9-6, 6-4) got its first base runner of the night on an error the bottom of the second. Ethen Richmond singled home Austin Coleman to give Eastern a 2-0 lead in the top of the third. Wahama left two runners on base in the bottom of the frame, but retired EHS in order in the top of the fourth. Wahama’s first hit of the game came in the bottom of the fourth, and the hosts loaded the bases with two outs, before a flyout ended the frame. In the top of the fifth, the Eagles stretched their lead to 4-0, as Coleman drove in Mattox, and then Richmond singled home Nate Durst. The White Falcons left a runner on second in the bottom of the fifth, but didn’t reach scoring position again. A pair of WHS errors helped Eastern extended its lead to 5-0 in the sixth inning, and the EHS put the finishing touches on the 7-0 victory with two runs on three hits in the seventh. Richmond was the winning pitcher of record in a complete game for Eastern, striking out 10, while surrendering two hits and two walks. Dalton Kearns took the pitching loss in six innings for the White Falcons, striking out four and giving up five runs on seven hits and three walks. Tanner Smith pitched the final frame for the hosts, striking out two, while giving up two runs on three hits. Richmond also led the Eagle offense, going 3-for-3 with one run scored and two runs batted in. Coleman was 2-for-3 with a double, two runs and one RBI for the victors, while Durst was 2-for-4 with a run. Mattox, Josh Brewer and Matthew Blanchard each singled once, with Mattox scoring twice and Brewer scoring once. Both Brewer and Harbour earned an RBI in the win. A double by Tyler Bumgarner and a single by Kearns were the White Falcons’ only hits in the setback. Both teams committed three errors and left eight runners on base. 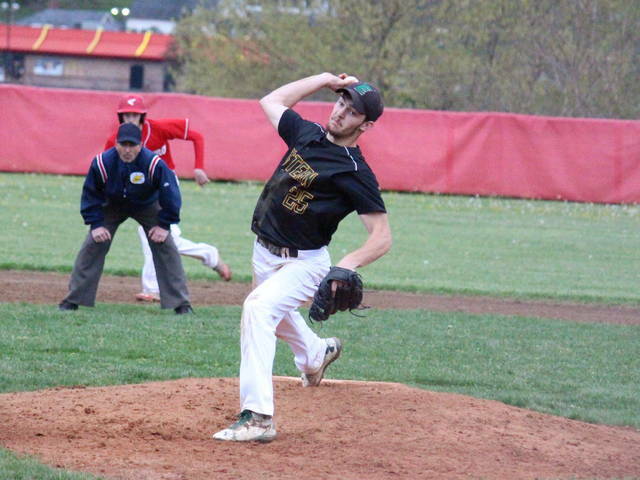 The Eagles won their first meeting with Wahama by a 5-4 count on April 9 in Tuppers Plains. Eastern is back in action on Friday against Whiteoak at Chillicothe’s VA Memorial Stadium. WHS finishes the work week on the road, visiting Waterford on Thursday and Federal Hocking on Friday.